Los Angeles Mayor Eric Garcetti is reportedly using his city’s bid for the 2024 Olympic and Paralympic Games as a bargaining tactic to fast-track Federal funding for a new subway line to the proposed Athletes’ Village site at Westwood Hills. It raises question marks over the bid’s claim that they are not dependent on public funding for any area except for security. According to the Los Angeles Times, Garcetti travelled to Washington D.C. this week hoping to convince Secretary of Transportation Elaine Chao into fast-tracking $1.3 billion for the project. He believes that the Purple Line, due to reach the UCLA sites for the Athletes’ Village and the Pauley Pavilion judo and wrestling venues, would not otherwise be ready in time for 2024. The official is therefore reportedly “banking on the [Donald Trump] Administration’s desire” to host the Olympics. Improved metro lines are a major selling point of the Los Angeles 2024 bid. Planned construction work is not included in either their operational or infrastructural budgets because the work is supposedly planned irrespective of the bid going ahead. insidethegames has been told that Garcetti is using the Olympics as a political bargaining chip to ensure the funds are available. They have already been guaranteed the funds but are seeking to receive them this year. It is claimed the line is “nice to have but not need to have” for the bid. Other forms of public transport, including bus links, will be sufficient for the expected number of spectators to reach the site, it is claimed. Competitors would be expected to travel via Games lanes to and from the Athletes’ Village. The bid did not present the Purple Line to the International Olympic Committee (IOC) during last week’s Evaluation Commission inspection because they will have “sufficient resources to move athletes, spectators, workforce and residents without it”, insidethegames has been told. All four primary Olympic venue hubs – the Downtown, Valley, Long Beach and South Bay Sports Parks – are due to be within 3.5 kilometers of a train or bus station. 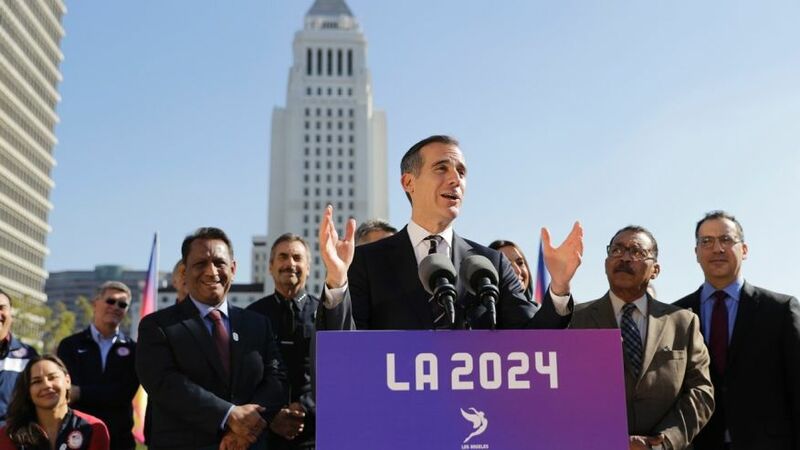 “In November 2016, voters passed Measure M, providing $120 billion for transit construction and programs,” a Los Angeles 2024 spokesperson told insidethegames . One of the major selling points of Los Angeles 2024 is that they will organize an Olympic and Paralympic Games dependent on private, rather than public, investment. They claim this means less risk and burden on the Californian public. Their only rivals, Paris 2024, are part-publicly financing a new Athletes’ Village site located on the banks of the River Seine. A 2024 host is due to be selected at the IOC Session in Lima on September 13. The IOC Executive Board are due to meet on June 9 to consider plans to also award the 2028 edition this year.